The first season of The Unbreakable Kimmy Schmidt has only been available for our streaming pleasure for less than a week, and we as a nation are already obsessed. I'm in love with Kimmy Schmidt, her ragtag crew of fellow misfits, and her onslaught of frozen-in-the-'90s references. Despite the fact that she's a kidnapping victim suffering from symptoms of PTSD, she's an energetic, lovable hot mess trying to find her way in a modern world. Naturally, her suitors, like Kimmy's rich boyfriend Logan, have nabbed my attention. The recurring characters on this show are outstanding, as are the cameos. But it's Tina Fey's second TV child, so of course the cameos are star-studded. Everyone in Hollywood knows the level of Tina's comedic power and they. want. in. That includes the man behind the wealthy party boy whom Kimmy meets through Mrs. Voorhees: Logan Beekman, self-proclaimed "Daddy's boy," becomes Kimmy's hunky boyfriend. 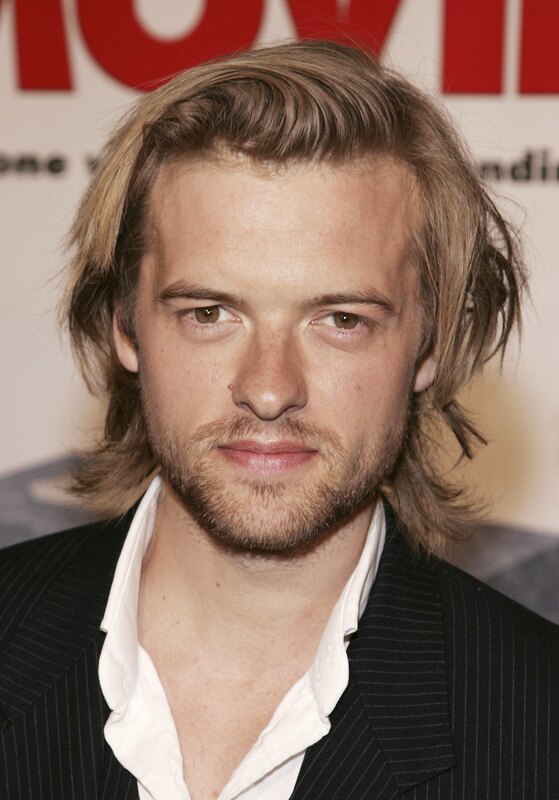 But if you're a fan of the small screen, Logan is probably pretty recognizable because he is played by Adam Campbell. Go ahead, allow seeing his beautiful face and soft blonde coif give you that "Hey, what do I know him from?" feeling. You are not alone. Campbell has been quietly and subtly showing up in your favorite shows and movies for years. And it's about time you start recognizing the hilarious actor. Warning: Kimmy Schmidt spoilers ahead. You have probably seen him in everything from Epic Movie, Harper's Island, Day One, Up All Night, Parenthood, Touch, all the way to his more recent stint on Mixology and his role as d-bag Mike in Hello Ladies: The Movie on HBO. He's great at playing a borderline jerk. Maybe it's the hair? I don't know. Either way, you get lured in by those enchanting eyes and that toothy smile and your eyes get ready to roll once an offensive or rude comment effortlessly slips out of his mouth. On Kimmy Schmidt, he is once again an irresistible charmer. He's a rich boy at a fancy party and even after he finds out that Kimmy is the nanny/animal masseuse, he accepts her for who she is. He's sweet and is attracted to her goofy, oblivious self. Then once he feels threatened by Dong (and you can't blame him because Dong is crazy hot — the character not the, umm, I'm just going to avoid digging myself deeper here), he turns into a superficial jerk and gets Dong in hot water with immigration. Kimmy effectively ended her relationship with him after finding out what he did, but here's hoping there's more Campbell in our future — even if he needs to stay away from Kimmy... and dolphins from here on out.